Christopher Paul Stelling has been kicking around under the radar between Daytona Beach and New York City for years, apparently working on his craft until he felt the time was right to sign a deal. Judging from his material and performance, and the confidence with which he presents the songs on Songs of Praise and Scorn, the time may have been long past. The album opens strong with “Mourning Train to Memphis,” strangely and immediately reminding one of the young Dylan. Strangely because Stelling plays nothing like Dylan, using finger-picked arpeggios that sound random but that are obviously totally calculated, and singing lyrics far more accessible than much of Dylan’s material in a high timbre. It actually takes a couple times of hearing Stelling sing “Tomorrow I’m leaving for Memphis on the mourning train/going to see a wise old man he’s still got his brain/his body’s playing tricks, it’s got him in a pinch/cancer been spreading it’s stealing his life away inch by inch” to realize that the lyrics somehow sound a lot more abstract than they really are. But that’s not to say that Stelling can’t take a trip to some faraway land where more artsy types leave listeners scratching their heads. “Why we all can’t go about dressed in white/instead of walking home unto these beds of hot coals glowing red in the night/but for now we all just go about searching for gold/while the children learn to play with all of our poisons of old,” he sings against suspended chords on the downtempo “Strange Darkness,” a song that could have been a modern-day collaboration of Pete Townshend and David Bowie. Stelling sounds like perhaps a more animated Rod Picott, but still projects the feeling of a hardworking blue-collar troubadour ala Picott or William Elliott Whitmore. His guitar work on “Solar Flares” brings to mind the late Chris Whitley’s performances circa Living with the Law, and his compositions combine unusual voicings with stock progressions and the odd major 7th chord, all reportedly recorded with no overdubs vocally or instrumentally. In other words, this is supposed to be exactly what the guy sounds like live. 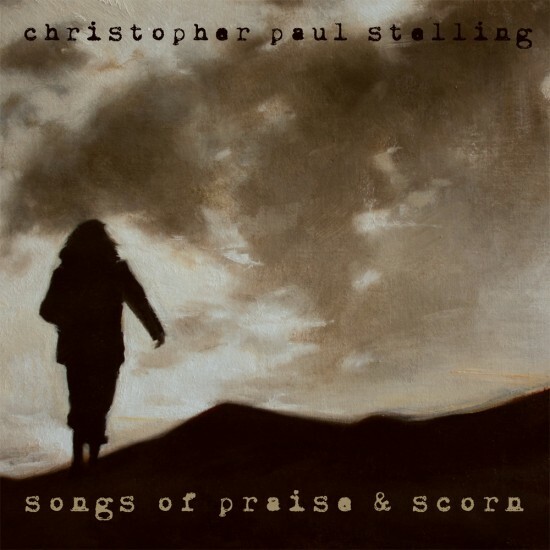 Stelling is an artist who can leave one shaking one’s head in bewilderment over how somebody can play difficult guitar parts and sing a completely disparate melody line at the same time. But he also hasn’t forgotten how to just play simple chords when that’s what a song calls for. With occasional female harmonizing and violin, Stelling has put together an album that will hopefully draw people to live performances where they can see what a real self-contained, modern-day troubadour looks and sounds like. Songs of Praise and Scorn is a fine way to introduce someone who should be a voice to be reckoned with in the years to come.